MAJOR PRICE REDUCTION! Seller Motivated! Simply breathtaking panoramic view seen from the balcony of a wrap-around deck! This unique condo features two bedrooms and an additional Loft and attic that are NOT included in the 1,242 declared total square footage! 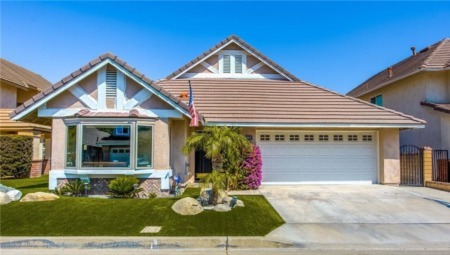 Nestled in the borders of Yorba Linda and Anaheim, situated in an area of prestige neighborhood among the 20-unit Townhouse Complex, this is a must see! Upgraded features of this home include tinted one way viewable windows, recessed lightings, fresh coat of paint, hardwood floors and vaulted ceilings. There is a brand new $15,000 AC unit! Stainless steel stove, microwave and dishwasher are included in this gorgeous kitchen. A movable island that matches the granite counter tops and customized white cabinets, also a backsplash and pot filler faucet are added features too! A two car garage space is included in this townhome, and there is ample visitors parking right next to the association's swimming pool! A very prestigious complex you won't want to miss! SchoolsClick map icons below to view information for schools near 2025 Orchard Drive #A Placentia, CA 92870. Listing provided courtesy of Maria Lee, Century 21 Diamond.